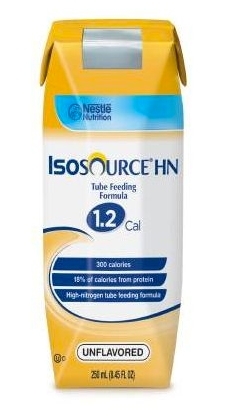 Isosource HN® 1.2 Cal is a high nitrogen complete liquid tube feeding formula. It provides high-protein nutritional support. The formula provides 1.2 calories per mL. It is unflavored. It comes in 250 mL cartons (as shown in image) or ready to hang 1000 mL or 1500 mL bags for tube feeding. This product is a medical food for use as directed by a medical professional. It is not intended to diagnose, treat, cure or prevent disease. Detailed nutritional information is located on the Nutritional Information tab of this page. You can find the ingredients listed on the Ingredients tab. Water, Corn Syrup, Soy Protein Isolate, Canola Oil, and less than 2% of Medium Chain Triglycerides (from Coconut and/or Palm Kernel Oil), Potassium Citrate, Calcium Phosphate, Salt, Magnesium Phosphate, Maltodextrin, Choline Bitartrate, Sodium Ascorbate, Potassium Chloride, Soy Lecithin, Carrageenan, Alpha-Tocopheryl Acetate, Zinc Sulfate, Ferrous Sulfate, Niacinamide, Vitamin A Palmitate, Magnesium Oxide, Calcium Pantothenate, Copper Gluconate, Vitamin D3, Citric Acid, Pyridoxine Hydrochloride, Manganese Sulfate, Thiamine Hydrochloride, Riboflavin, Folic Acid, Chromium Chloride, Biotin, Potassium Iodide, Sodium Selenate, Phytonadione, Sodium Molybdate, Vitamin B12.